American Eagle Airlines recently used ATP's pilot recruitment tool, PilotPool.com, to reach out to hundreds of pilots to notify them of newly reduced hiring minimums. American Eagle also announced that they will interview pilots who have 500 hours of total flight experience with 50 hours of multi-engine experience. If the pilot completes the interview successfully, they will be sent to participate in ATP's Regional Jet Standards Certification Program, paid-for by American Eagle. The post stated: "American Eagle Airlines is excited to announce that we have adjusted our new hiring minimum. American Eagles hiring goals are to hire over 670 pilots in 2011, and foresee hiring to continue into 2012. Two year signed commitment to fly for American Eagle Airlines"
Pilotpool.com is a pilot recruitment tool that airlines have been using as a first point of contact to track and recruit all past and present customers of ATP as they work their way through the flight training pipeline. ATP Airline Career Pilot Program students are tracked real-time by recruiters and the student themselves can see exactly where they stand with respect to their peers and airline hiring minimums. A pilot using PilotPool.com will be notified when a recruiter has accessed their profile or downloaded their resume. Likewise, recruiters can make sure they are notified when a pilot they have been tracking reaches a certain milestone in their flight training that meets their hiring criteria. 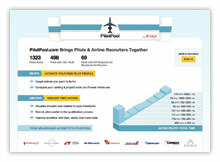 The recruiters can then use PilotPool.com to contact the pilot and arrange for an interview.